I am currently advertising one Ph.D. student opening in my lab in the Department of Biology at the University of Saskatchewan, ideally to begin September, 2015 (January or April, 2016 start dates may also be feasible). Full funding ($20k CAD/yr for 4 years) is guaranteed, but the successful student will be expected to apply for any funding for which they may be eligible (e.g., NSERC post-graduate scholarships for Canadian citizens). The Kluane Red Squirrel Project (KRSP) was established in the late 1980’s and now represents one of the longest running and most-comprehensive studies of a wild mammal in the world. Researchers from multiple universities are involved and exciting collaborations have produced many important, interdisciplinary findings. A clear strength of this project stems from our ability to link the biology of the population with a key environmental driver (availability of their primary food source – white spruce seed, cached as cones). 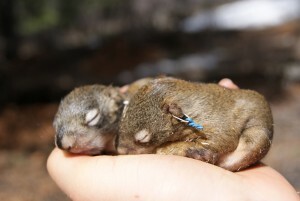 The advertised project will investigate the causes and consequences of phenological variation (i.e., annual timing of key life cycle events) and how this variation fits within the broader life history phenotypes of individual squirrels. Phenological shifts are now the most often cited ecological responses to climate change and can have substantial consequences for individual fitness and population viability. The project will combine analyses of our long-term data set (comprising data on >10,000 individuals, collected over 10 generations and 25 years) with new field data collection. Quantitative genetics analyses will be used to estimate heritabilities and genetic correlations (i.e., evolutionary potential) in phenological traits and opportunities are available to collaborate with other researchers in energetic physiology, population ecology, endocrinology and animal behaviour. All fieldwork will occur in the spectacular southwest Yukon Territory at KRSP’s field camp. The successful applicant will have a GPA >80% (converted to the UofS’ 1-100 scale) over the past two years of schooling and a degree in a relevant discipline (i.e., Ecology, Evolutionary Biology, Physiology, Environmental Biology). Of note, while I certainly appreciate the hard work that is put into obtaining a degree in Biotechnology, I do not view this as relevant experience for these positions. In addition, a passion for fieldwork (in a beautiful, but remote, place), strong scientific communication skills (both written and oral) and statistical proficiency (or a willingness to gain it) is necessary. Evidence of scientific productivity (manuscripts published or in preparation, conference attendance and presentation) is also expected. This position is open to both Canadian and international students. If you are interested in applying, please submit a cv (including names and contact details of references), a short (1 pg) description of research interests and an unofficial copy of your transcripts to jeffrey.lane@usask.ca. Applications will be evaluated as they’re received. To ensure full consideration of your application, therefore, please submit asap. Any questions can be directed to Jeff Lane. Thank you in advance for your interest in this position, however, only those selected for an interview will be contacted. This entry was posted in Graduate Work, News by jahaines. Bookmark the permalink.